Totternhoe continued to chase league leaders Park View with a comfortable 3-0 win at MK Gallactico on Saturday. The visitors had several players missing, but still were in control early on when Ashley Farmer finished well from 12 yards. They then doubled their lead with a superb team goal on 23 minutes as an move involving almost every outfield player saw Joe Smith find the net after Chris Golding’s cross. Gallacticos started the second half well and were on top, as they had a wonderful chance to pull one back from the spot when Dan Dyer was adjudged to have handballed in the area. The hosts’ skipper stepped up only to see an injured James Bromhall, who could barely move, tip the effort around the post. 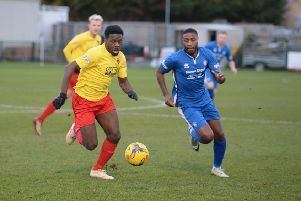 The Totts then wrapped up the points against the run of play when a counter attack was finished smartly by Smith for his 18th goal of an impressive season. Boss Chris Robson said: “We went into the game with a bit of a squad crisis. “We had injuries, players away and most worrying an inured keeper. “Thankfully Jimbo managed to play and we knew we just had to keep the ball away from our goal. “We started well and should have been out of sight after 10 minutes, but we were very wasteful with our chances. “We got the goal then completely stopped playing. We had a gameplan which for some reason went out the window and we allowed Gallacticos to get a foot into the game. “Thankfully our defence defended superbly throughout which meant although they had a lot of the ball they never really tested us in the final third. “Out of the blue we clicked back into gear and probably scored our goal of the season. “We were very patient in possession as we knew we had to be on such a small pitch with no space in behind to exploit. “We dragged the opposition out of position and the speed of build-up play allowed us to open up Gallacticos and Joe finished a great team goal. “The second half I felt we were lucky to not throw the game away as we were dreadful, probably due to the walking wounded struggling, and we couldn’t carry them anymore. “If Gallacticos scored the penalty I feel they would have turned the game around, but somehow Jimbo was the hero making a save in agony to give us the extra boost to see out the game. Totts host Amersham Town this weekend and visit The 61 FC (Luton) on Monday. Totts: Bromhall, Rimmer, O’Conner, Dyer, Murchie, Brent (Irons), Golding, Murray, McCormick (Loasby), Farmer (Cleere), Smith.